Here is the complete guide of Japan's annular total eclipse, scheduled to be happened on Monday morning of May 21, 2012 throughout Japan. Although the moon blocks the part of sun, the sun light is still strong. You MUST NOT see the sun directly. You MUST follow the following guide in order to safely observe the rare eclipse in Japan. Safety First! If you do not follow the safery tips, you may lose your eye sight and become blind! Also, check out the comprehensive event and live cast listing. Annular eclipse is NOT total eclipse. During the total eclipse, the moon blocks the sun completely, and it gets dark. The annular eclipse DOES NOT block the sun completely. It will be as bright as regular day. You WILL NOT see the difference unless you use the sun filter. 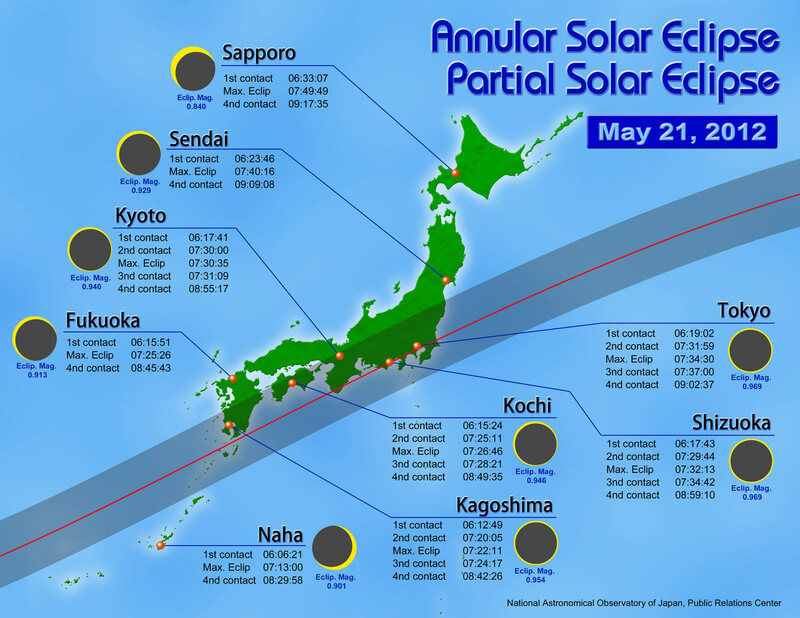 According to the map made by National Astronomical Observatory of Japan (NAOJ), the people in the most of the south of Japan can witness the total solar eclipse. Here is the interactive Google Map to find out if you can observe the annular total solar eclipse in your neighborhood. NAOJ is distributing the PDF English Solar Eclipse Viewing guide. All experts suggests that you MUST use the solar filter. Solar filter is much thicker than regular sun glasses. But many stores may already sold out the solar filter. If so, you can still try to purchase online. Sunglass DOES NOT WORK. DO NOT look at sun directly with sunglasses. Neutral desnsity (ND) filter for photography DOES NOT WORK. You may break your camera. Any other colored filtered material that you can see through the other side. People misuse the way to use the sun filter. Then look up the sky to locate the sun. DO NOT place or wear the sun filter AFTER you locate the sun. You MUST place or locate the sun filter BEFORE you start looking at the sun. If you're seeing this article at the last minutes, sun filter glasses may be sold out already. And you may be debating whether to risk your eye sights or give up. However there are a several alternative safe and easy ways to observe the annular eclipse by using the pin-hole technique. Observe the shape of shades. By doing so, the shape of the shade gradually changes as the annular eclipse happens. Please make sure to read PDF English Solar Eclipse Viewing guide carefully. And have a safe observation! Don't forget to check out the list of events and live cast.